Beirut is alive with the sound of protest. It’s just gone 8pm and hundreds of demonstrators have surged through a makeshift barricade heading towards the Grand Serail and the centre of government. A young man wrapped loosely in the Lebanese flag is urging the crowd forward as pockets of demonstrators chant loudly, their slogans repeated incessantly as firecrackers mimic the sound of gunfire. The police watch impassively. They are clumped together in lines securing key buildings, funnelling the crowd down Riad al-Solh towards Waygand Street and once again into Martyrs’ Square where thousands had gathered earlier to protest against the chronic failings of central government. There is no access to Nejmeh Square and Parliament, leaving a thousand or so to congregate outside the offices of LibanPost. They chant and sing as lights thrown from emergency vehicles dance across the restored façades of Downtown. What kind of Lebanon do you want? “A Lebanon I would never think about leaving,” replies Sarah Shaar a few weeks later. She is at home in Saida when we talk. Every now and then she stops, sips from a cup of Turkish coffee, and resumes. It’s a few days after the latest round of demonstrations – demonstrations that have been held against widespread corruption, the government’s failure to solve a garbage collection crisis, and the sectarian nature of Lebanon itself. Although areas of Downtown remain cordoned off, especially those around Parliament, Beirut appears relatively calm. “I want a Lebanon that goes back to what it was 50 years ago,” says director Edwin Harb Kadri. “When Lebanon was the leader of the free-thinking intellectual Middle East. When it was a regional and worldwide example of people from different religions and schools of thought living together in peace and prosperity. At the heart of the ongoing civil protests is an almost overwhelming discontent with Lebanon’s political reality. Garbage piled high in the streets and left uncollected is merely a visible embodiment of government corruption and political dysfunction. No electricity, no water, no security, no president. This is Lebanon today. Garbage is but one element. It has been more than 14 months, for example, since the kidnapping of 40 Lebanese military and security personnel by Jabhat al-Nusra and Islamic State during fighting in the town of Arsal on the Syrian border. The government’s inability to negotiate the release of the 25 soldiers still held captive illustrates – in the minds of many at least – the government’s repeated failings of its own citizens. As such, protests against government inaction resumed on 4 October, with the families of those held hostage blocking many of Beirut’s main arteries, including airport road, Riad al-Solh Square and the main thoroughfare through Raouche. Further demonstrations by activists affiliated to the We Want Accountability and Go Away movements have demanded cuts to MPs’ pay, claiming they have received billions of pounds in salaries since they extended their own terms of office without election last November. As one Lebanese law student quoted by Al-Monitor stated on Facebook: “We can no longer find the word ‘election’ anywhere, except in the dictionary. Perhaps it is just a word from an ancient and obsolete language. At best, we might come across it in the courses we took about constitutional law, but it is definitely a strange practice for Lebanon”. Do you have hope for Lebanon? Those seeking to change the country from within are Lebanon’s greatest hope. Those who love their country and see within it great potential. Many have been injured and/or detained by the authorities and all no doubt, like Fares, seek a secular civil democracy without militias and with equal rights for all. Amongst those detained but later released after 11 days was Pierre Hachach. He faces charges of incitement to violence, which he strenuously denies. Although recent events paint a negative image of Beirut, the Lebanese have always had a love/hate relationship with the city. The only difference now is that the garbage crisis has brought with it the threat of disease and has made Beirut increasingly unliveable. The list of confrontations has also steadily grown. On 8 October, security forces used water cannon and tear gas to disperse protesters attempting to gain access to Nejmeh Square, the home of Lebanon’s parliament. On 20 September, fighting broke out between pro-government and anti-government supporters during an otherwise peaceful rally. On 16 September, hundreds gathered in Riad al-Solh Square to demand the release of protesters detained during clashes earlier in the day, while on 1 September around 30 activists broke into the Ministry of Environment and demanded the immediate resignation of the environment minister, Mohammad Machnouk. Amongst those beaten by security forces was theatre director Lucien Bourjeily. On 29 August, an estimated 10,000 people protested peacefully in Martyrs’ Square, although elements later attempted to break through security barriers near the Grand Serail, the headquarters of the country’s prime minister. The movement has continuously sought to distance itself from protesters engaged in violent clashes with the police. Following demonstrations on 22 August, the country’s prime minister, Tammam Salam, promised to take action against police who had used tear gas, rubber bullets and water cannon to disperse demonstrators in a display of excessive force. Yet the use of such force has continued. “I was beaten up, tear gassed, assaulted, and so were most people down there while we were asking for the most basic of rights,” says Kadri, who has since moved to Barcelona to study for a masters in film. “But that’s also what made it beautiful. That we all went together, believing in each other. The romance of protest, however, has arguably been short-lived. Although demonstrations have continued since July, numbers have dwindled and disputes over direction have arisen, while the movement as a whole has found itself accused of lacking political clarity. It is also arguably a middle class movement devoid of popular support. Can the civil movement succeed? 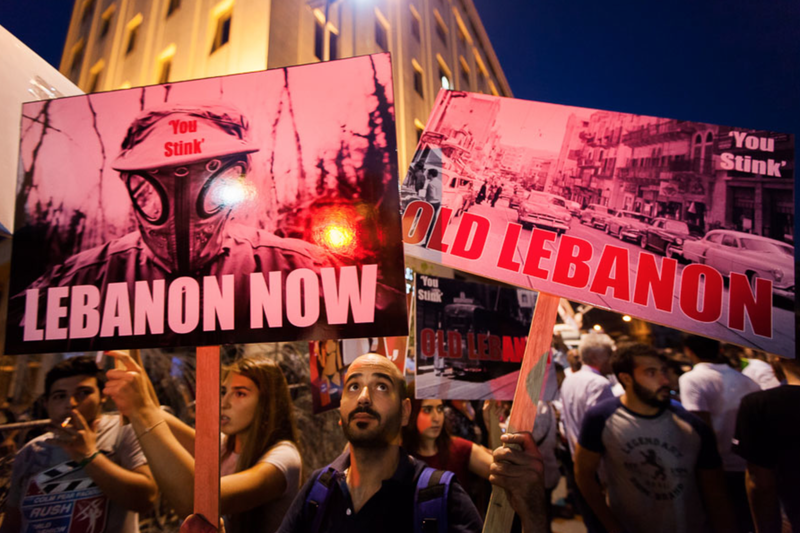 “The protests are, for the first time since the beginning of the Civil War, an unapologetic, naked, uncensored demonstration of what Lebanon’s society is really capable of,” adds Lana Chukri. “We are regretfully living political corruption that for years nobody ever thought they had the right to discuss, let alone demand to be fixed. The protests have changed that. They have allowed a non-sectarian space for the Lebanese people to finally be able to make demands that they are unashamed to ask for, as they shouldn’t have had to ask for them in the first place. They have realised that today, in 2015, we have the mentality of the first world yet are categorically scraping the surface of not even the third world. For the first time, in a long time, that mentality has shifted. “We have realised, and accepted, that every penny we are paying to live, we are barely surviving in. For the first time, in a long time, the protests have allowed us to be angry. To be unafraid. To be loud. For the first time, in our history, the protests have brought together people of all religions, backgrounds and social statuses into a space where finally questions are being asked. The right questions are being asked. A space where regardless of police brutality, will not be cleared until those questions are answered. “These protests are anything but negative. They are uncomfortable, yes. Because they beg people to be open and honest with themselves for once. Because they beg people to desert a social construct that they had been used to for decades. Because they beg people to become leaders and not followers, and those are all huge responsibilities. Because they beg people to stop accepting the bare minimum and boasting about how great our country is. No, we can actually be great, and with that kind of mentality, it begs people to realise that maybe the politicians and thugs and warlords they have been dictated by for years are very, very, very wrong.